When CBS first announced a Big Bang Theory spin-off in November 2016, many weren't surprised when it came together quickly and ultimately got a series pick-up, but there are still plenty of questions that remain. During the TCA summer press tour today, Young Sheldon co-creator and executive producer Chuck Lorre answered one of those burning questions, revealing where exactly the show is set, when asked if fans would ultimately see the death of Sheldon's (Iain Armitage) father, George Cooper Sr. (Lance Barber). Here's what the creator/executive producer had to say. "We're not going to play fast and loose (with history). But (Young Sheldon takes place) five years before (George's death). And people change and grow and develop, and things happen over the course of many years. And we don't have to follow an exact timelines. A season doesn't have to be a year. It could be a couple months. We have a lot of freedom with the backstory." It has been confirmed that Young Sheldon, which has a pilot episode directed by Jon Favreau, will begin with Sheldon Cooper at nine years old, and die-hard Big Bang Theory fans will likely recall that Sheldon (Jim Parsons) told Bernadette (Melissa Rauch) in a Season 7 episode that his father died when he was just 14 years old. However, as per Chuck Lorre's statement, courtesy of TV Line, that doesn't automatically mean George Cooper's death will take place in Season 5. Chuck Lorre added that fans will learn that there is much more to George Cooper Sr. than meets the eye. "We're going to show that there's a great deal more to the man than we discussed (on Big Bang Theory)." Chuck Lorre co-created the series with his fellow Big Bang Theory executive producers Bill Prady and Steven Molaro. The series centers on 9-year-old genius Sheldon Cooper as he grows up in East Texas within his family of Christian normalcy. Being a once-in-a-generation mind capable of advanced mathematics and science isn't always helpful in a land where church and football are king. And while the vulnerable, gifted and somewhat naive Sheldon deals with the world, his very normal family must find a way to deal with him. The cast also includes Zoe Perry as Sheldon's mother Mary, Montana Jordan as his older brother, George Cooper Jr. and Raegan Revord as his sister Missy Cooper. Jim Parsons will narrate the series as the adult Sheldon Cooper. On the flagship series The Big Bang Theory, Sheldon's mother Mary was played by Laurie Metcalf, who has appeared in 11 episodes since the show's first season in 2007, with Courtney Henggeler playing Missy in just one episode, towards the end of the first season. Sheldon's brother George Jr. has never been featured on The Big Bang Theory, although Sheldon has mentioned him numerous times throughout the hit series. 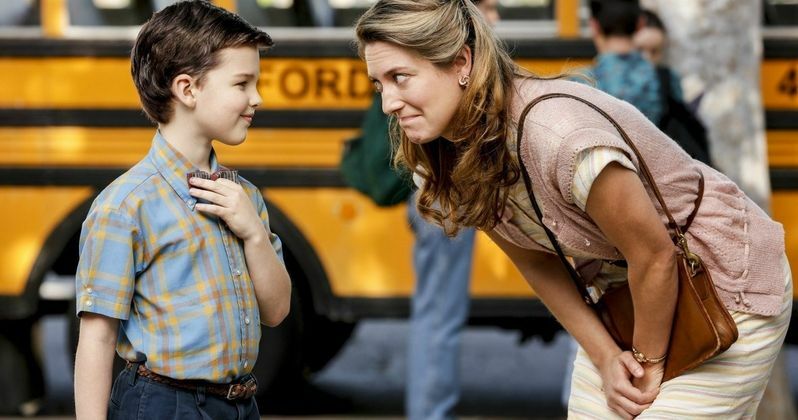 Young Sheldon will debut Monday, September 25 at 8:30 PM ET, directly following the Season 11 premiere of The Big Bang Theory.